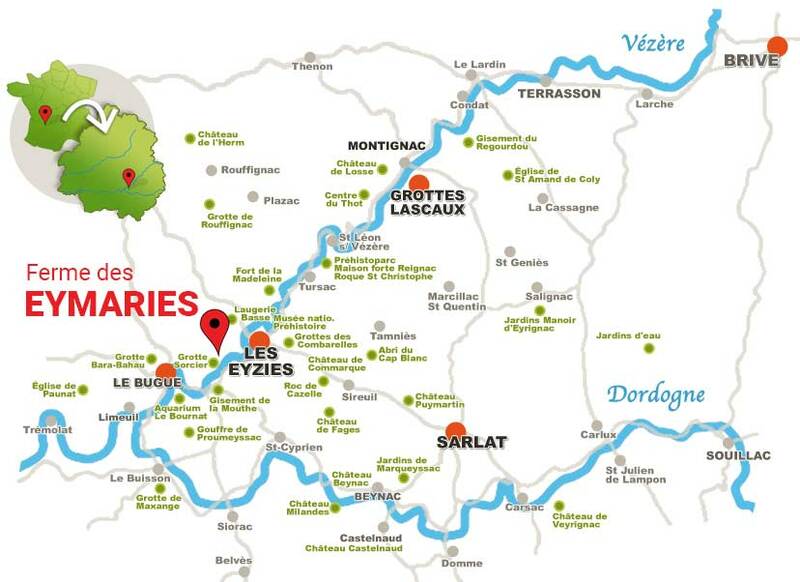 The Eymaries farm is well situated in the southeast of the department Dordogne which provides the widest range of tourist offers in Dordogne. At less than 5 minutes by car, Les Eyzies-de-Tayac, the world’s capital of prehistory or even “Cradle of Mankind” comes up with many prehistoric sights, among them the National Museum of Prehistory. At only 7 km, le Bugue, is also a well situated village in the center of the perigord with very interesting sights to visit. Along the river you have the beautiful village of Montignac but also Saint-Léon-sur-Vézère and many prehistoric sights to visit. This valley offers inner peace, ideal for nice trips with familly and friends, or for walking or montain bike activities. The visit of the excellently restored medieval town centre of Sarlat is a must! With its markets, fairs and guided tours it is in summer pretty lively. In winter there are the Truffle Fair, Goose Fair and the Christmas Market. Many local sights embellish the Dordogne valley: the villages Beynac, La Roque Gageac and Domme, which are among the most beautiful villages of France, furthermore Castelnaud, Marqueyssac and many others.